I decided to give this subject its own blog entry. It doesn't belong with "Enchanted and Unexpected." I'm not even sure where to start (or where it belongs), so...bear with me. I'm not quite sure how it happened. It started with The Butterfly Garden by Dot Hutchinson. I was a bit unsure of that one. But there was something about it I liked. I also enjoyed the short novel The Grown-Up by Gillian Flynn (both were mentioned in my June 5th post). I decided to test out a few more "creepy" ones to see if I actually liked the genre, or if I was just fascinated with something new. I just finished Don't Breathe a Word by Jennifer McMahon, and I can definitely say I'm now hooked on weird, creepy novels where I'm never quite sure where they're going to end up. Don't Breathe a Word definitely fits that bill! The funny thing is, I actually became interested in this particular book because of the vast differences in reviews I read on Goodreads when I was trying to scope out some creepy books for my "testing" process. I can definitely say I'm in the category of people who loved it! (Maybe that one-star-reviewer is a Twilight fan?) It's even hard for me to use the word "love" when talking about a creepy book, but I DID love it - creepiness and all. I think the real fun for me is how busy it keeps my brain, as it tries to figure out how the tale will turn next, what is real and what isn't, and trying to decide if it trusts the narrator. 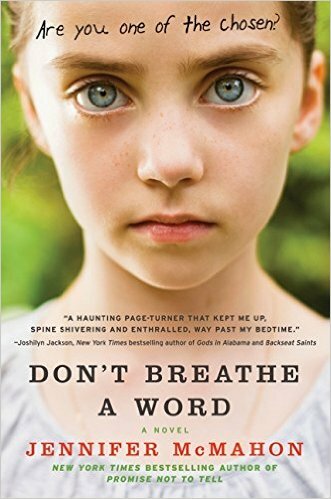 Don't Breathe a Word is about a woman, Phoebe, who finds herself in the middle of a family mystery. Her boyfriend's sister disappeared fifteen years ago, and the mystery has come back to haunt them. It's difficult for Phoebe to know what is real and what isn't. She's haunted by her own demons, while she tries to help him figure out his and what happened to his sister. The novel goes back and forth between present day and fifteen years earlier. It is dark, it is twisted,...aaaaaand it is plays on that little girl "niggle" in the back of my brain that remembers (quite clearly) when I used to jump as far out from my bed as possible for fear of something grabbing my feet. The story really pulled me in, and I finished it much faster than I wanted (3 days),...but I couldn't help it. It is a definite page-turner! 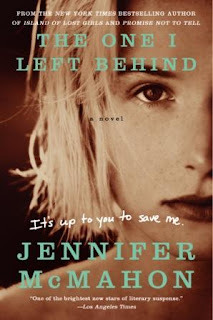 I am happy to say that McMahon has other novels along this same line, and I have just started the next one, The One I Left Behind, and I am thrilled! I am aware I read books for a variety of reasons. Most of the time, it's to understand more about myself and the people around me. It's to find connection, comfort, insights, adventure, and laughter. When I think about the books I usually read, I know all the things I love about them. So, why the attraction to the weird, the morbid, the demented, and the creepy? I like that it's a puzzle I'm trying to solve, that's certainly part of it, but there's more to it than that. I think it's because...there's no love. (Wait, I'm checking my brain.) Yes,...yes, I do believe that is part of the appeal. I've never really read "romance" novels but, as my youngest daughter pointed out to me not too long ago, almost every story has some kind of love story in it. And she's right. In fact, I just remembered the reason I found The Butterfly Garden. My daughter told me she'd read more novels if I'd find books that didn't have a love story in them. THAT is how I got started down this warped (but enjoyable) path! And, I admit it, I'm enjoying the books being about the mystery, the weirdness, the oddities, the crime, and NOT being about who ends up with who in the end.